Season fish with cumin, chili powder, and garlic salt to taste. Broil or grill fish until it flakes easily with fork, a few minutes a side. For sauce, combine sour cream, mayonnaise, cumin, dill, and garlic salt. Add lemon juice until sauce is nice consistancy, not too thick, but slightly runny. For the tortilla shells, you can have soft or you can fry them if you prefer crispy shells. 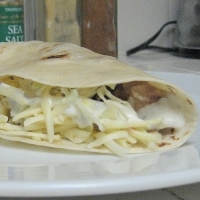 To assemble put some fish in the tortilla, top with some cheese, and cabbage then pour on the sauce. Link back the review in IMI. Just picked up some fresh Tilapia and I cannot wait to use it to make these! They look amazing! These look really good and you make me want to go to the seafood section to see what fish is on sale and plentiful now! Made this last night...it was delicious!!! These are fantastic! I made the recipe exact except I used garlic powder in place of the garlic salt (I used just a dash of the g.s. to get some salty flavor). I quickly deep fried the tortilla so it was crunchy on the outside but still soft on the inside. We loved it! Oh yeah, I used cod. I think this was pretty good but I know it would of been great if I would of seasoned the tilapia alot more. I don't think I used even close to the amount of seasoning I should of used. The sauce was great! Maybe I'll fry the fish next time. If I didn't screw up the fish...I know it would of tasted delicious! I hope you like my photo! 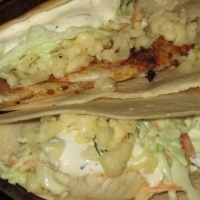 Sounds good...I don't usually follow a recipe for fish tacos, but I'll try this one! :) Thanks for the addition. I like the sounds of this. Absolutely love fish tacos! Love the peperjack suggestion. Like mrswilliams's recipes? Never miss an upload!